Our matte black painted metal Coal Hod is both functional and durable. Corrugated sides give this hod extra strength and holding capacity. Includes wire handle. 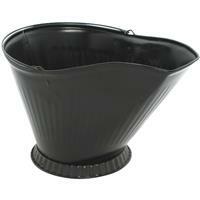 Coal Hods are also called coal scuttles, coal pails, or coal buckets. Originally designed to carry coal to the fireplace, our coal hods have a great classic shape and can also be used for decorative storage.